We’ve hade some problems earlier with a very slow BizTalk installation. It could takes minutes (!) to consume messages from MSMQ queues and the message queues can build up pretty quickly if throughput is that bad. 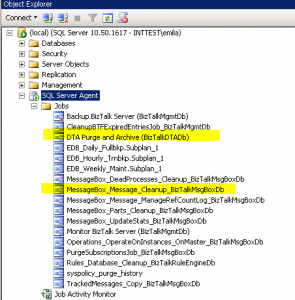 It turned out that the main problem was that the messagebox database was full of stale messages that should have been cleaned up, but wasn’t since the database job MessageBox_Message_Cleanup_BizTalkMsgBoxDb was not scheduled (which it should be). After this our BizTalk installation has been much quicker and now works as it should. The published message could not be routed because no subscribers were found. 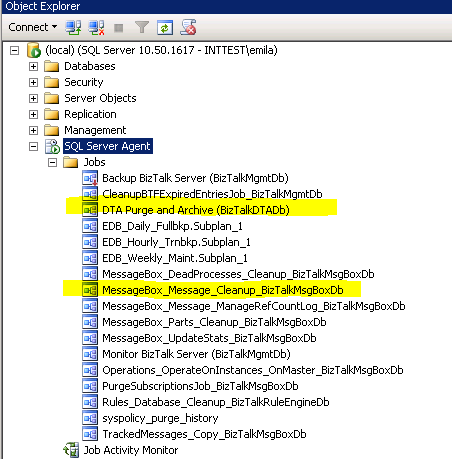 This error occurs if the subscribing orchestration or send port has not been enlisted, or if some of the message properties necessary for subscription evaluation have not been promoted. Please use the Biztalk Administration console to troubleshoot this failure. What the message says is that we have no subscriber to the response message of the Wcf request, and in many cases (one-way messages) we’re not interested in supplying one. Find the relevant SendPort in the binding file and change the value of IsTwoWay property to false. Comment out the ReceivePipeline and ReceivePipelineData elements inside the SendPort element. That’s all. Importing the binding file back into BizTalk Administration Console should update the send port. If it doesn’t, try to delete the old port before importing the binding file.